Sic Bo is a straightforward dice game that combines the excitement of craps with the playing style of roulette. It’s mainly popular with Asian players but you can find it in casinos in North America and at the online casinos as well Eastern gambling meccas like Macau. Sic Bo (pronounced see bo) is really easy to learn and since the dealer is in charge of rolling the dice, it’s also been adapted to be played online with a live dealer. Sic Bo means “dice pair” and it’s sometimes called Chinese dice, tai sai (lucky dice) or dai siu (big small). In this article we’ll explain everything you need to know about Sic Bo including how to play, a rundown of every single Sic Bo bet and each bet’s house edge, plus some strategies and bad bets to avoid if you want to get the most out of your money. Sic Bo is one of the easiest games in the casino. If you’re in North America you might have to go to an Asian-themed casino or at least the Asian-games section of the gaming floor to find it but online it’s pretty widely available. 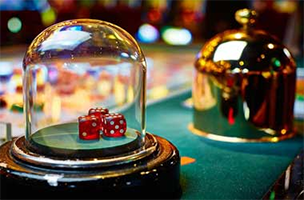 Sic Bo uses three dice that are rolled in a small cage by the dealer. Players can bet on the outcome of the roll in lots of different ways which we’ll explain in detail a little later. Each bet is just for the next roll, unlike craps which uses a much more complicated game structure and rolling process. This makes it easy to learn and lets you make lots of different bets like in roulette. Another similarity to roulette is that if you’re playing in a brick-and-mortar casino, each player will get their own special colour-coded chips so the dealer can tell which bets belong to which players. Just give the dealer cash or casino chips and he’ll give you chips. If you’re playing online you don’t have to worry about any of that. Just choose the denomination of chips you want to bet and then make your bets on the table. Most Sic Bo games offer the same bets whether it’s on the internet or at a brick and mortar casino. The squares on the gaming table explain each bet briefly but here’s a more detailed run-through of every single Sic Bo bet. We’ll also include the bet’s odds and the house edge of each bet according to the most standard payout structures. It’s important to remember that the payouts can change drastically depending where you play. If the payout odds are worse than what you see below, the house edge will be bigger. Small – This bet wins on a total of 4/10 except when the dice show three of a kind. It pays 1 to 1 and has a house edge of 2.78%. Big – Wins on a total of 11/17 except when dice show three of a kind. It pays 1 to 1 and has a house edge of 2.78%. A popular bet is just a straight bet on the three dice totalling a single number. To make this explanation easier we’ll pair numbers together like 4 and 17 since they have the same odds and payouts. The stats here apply to betting just one number. Total of 4 or 17 – The longest odds in Sic Bo. This outcome has a 1.39% chance of happening on a single roll. Payouts vary from 50 to 1 in Macau to as much as 65 to 1 in other places and online. If the payout is 65 to 1 the house edge is 8.33%. Total of 5 or 16 – This outcome has a 2.78% chance of occurring on a single roll. Payouts vary from 18 to 1 in Macau to as much as 32 to 1. If the payout is 32 to 1, the house edge is 8.33%. Total of 6 or 15 – Has a 4.63% chance of happening on a single roll. Payouts vary from 14 to 1 up to 19 to 1 which offers a house edge of 7.41%. Total of 7 or 14 – Has a 6.94% chance of happening on a single roll and almost always pays out 12 to 1 which gives this bet a house edge of 9.72%. Total of 8 or 13 – Has a 9.72% chance of happening on a single roll and almost always pays out 8 to 1 which gives it a house edge of 12.5%. Total of 9 or 12 – Has an 11.57% chance of happening on a single roll. It pays out 6 to 1 in Macau and Atlantic City and 7 to 1 in Australia. If it pays 7 to 1 it has a house edge of 7.41%. Total of 10 or 11 – Has a 12.97% chance of happening on a single roll. It pays 6 to 1 everywhere and has a house edge of 12.5%. 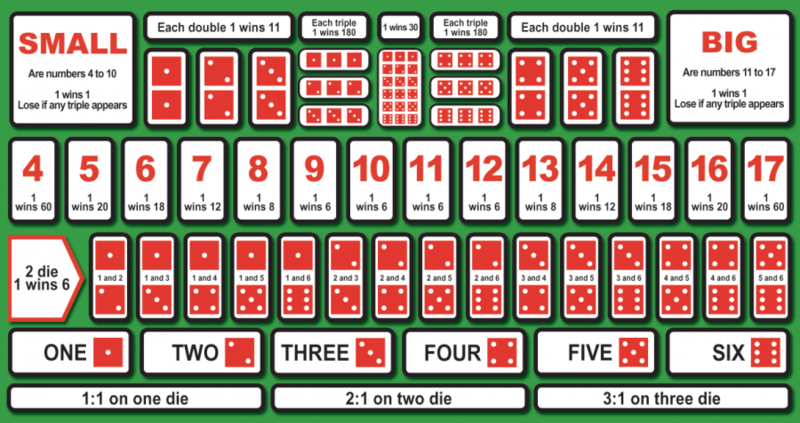 Double – A bet on the dice rolling at least two of a specific number (for example two sixes). Payouts range from 8 to 1 all the way up to 11 to 1. Specific Triple – A bet on all three dice showing the same, specific number (for example three sixes). Payouts range from 150 to 1 to 190 to 1. If it pays 190 to 1 the house edge is 11.57%. Any Triple – A bet on the dice showing three of the same number, no matter what number that is. It has a 2.78% chance of happening on a single roll and pays out anywhere from 24 to 1 up to 32 to 1. If it pays 32 to 1 this bet has a house edge of 8.33%. Domino (Two Faces) – A bet on a two-number combination coming up among the three dice rolled. The probability of this happening in a single roll is 13.89% and with a payout of 5 to 1 it has a house edge of 16.67%. Domino (One Face) – Similar to the other domino bet but two of the dice must show the same number. It’s basically the same as betting on a specific double and usually pays out 10 to 1 for a house edge of 7.41%. Any One Number – A bet on the dice showing a specific number. It pays out depending on how many dice the number shows up on. As you can see from the chart above, the payouts vary widely depending on where you’re playing sic bo. Since the odds of different outcomes stay the same, different payouts drastically change the odds of you winning or losing in the long run. Make sure to check the payout tables at the online or live casino you want to play at and pick the bets that offer the lowest house edge. In general a great strategy is to stick to the Big and Small bets since they have a low house edge of 2.78% in most games online and in real life. To reiterate, the odds of any outcomes happening never change and unless there’s something flawed with the way the dealer is rolling the dice, there is absolutely no way to predict the outcome of the next roll. That’s why you should focus on bets with the lowest house edge to give yourself the best possible chance of winning at sic bo.